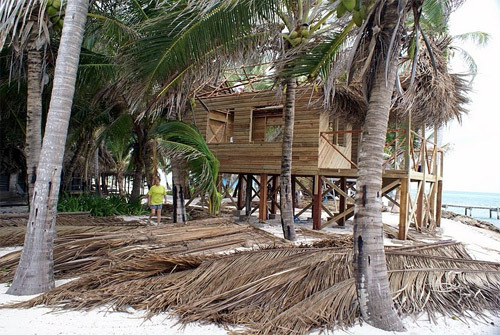 All guests love thatched-roofed cabanas at Belize beach resorts, but few people realize the effort it takes to build and maintain beach cottages on a remote island. We have built our cabanas with a simple design to avoid big losses should we lose a few to the waves and wind during hurricane season, but the biggest enemy to our structures is rust. The nails in all our buildings rust through in a short time, probably 10 years, right through into the wood. When we tear buildings down or do maintenance, sometimes the nails are as thin as wire (even though we always use galvanized nails of course). This makes for constant upkeep and maintenance, season after season. To begin, we have to transport all the lumber by boat to the island, which costs us more than the wood itself. Every board, nail, tool, and worker must be transported the 3-hour ride from the mainland. Then, we have to house a crew of builders for months at a time, provide tools, generators, gas, food, and kitchen crew for the builders. 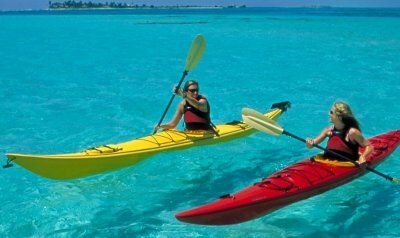 It is huge and expensive undertaking. 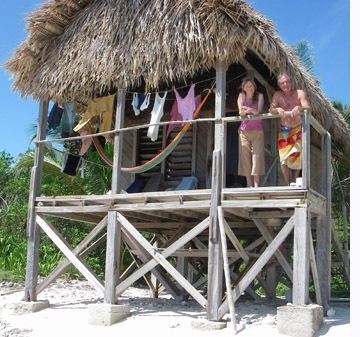 The thatch roofs give the cabins a true tropical atmosphere, and everyone loves spending time under these coverings, which are completely waterproof. 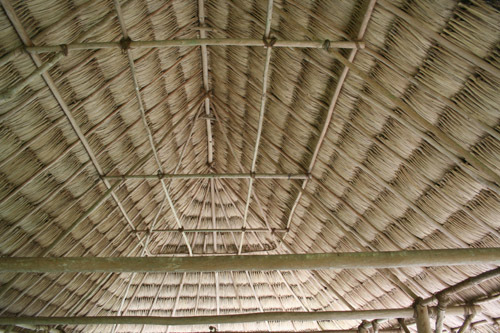 However, we have to bring the thatch in from the jungles of the mainland, we can’t use the local coconut palm thatch because it is not durable. We use Cahune Palm leaf, which last about 4 years. So someone has to go into the jungle and cut the leaf. Then the leaf must be collected and dragged to a roadway. Then the leaves are picked up and hauled to the sea, many trips! Finally the leaf is loaded onto the boat and brought out to the island and unloaded. it 8 leafs thick, then tie it off to the pole with a ‘running’ knot from a long cord that will tie off each course all the way to the peak of the roof. The local Mayans we employ know this craft very well, as most of them live in thatch roofed building themselves. You can observe their expert work from inside our buildings, where the rows of thatch create beautiful patterns. Every year in October I drive down all of the new gear in times for a pre-season building extravaganza. 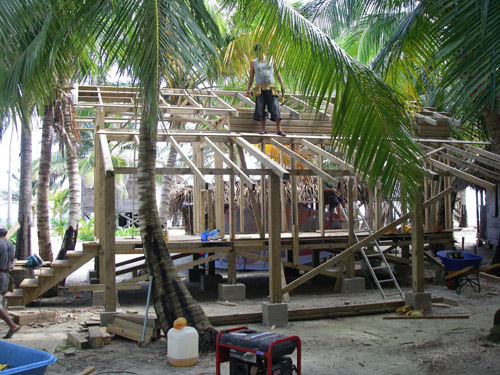 We usually build a new building or two, and re-thatch four or five of our twenty-something roofs. We do this during the rainy season, so we are often held up for days at a time by weather. 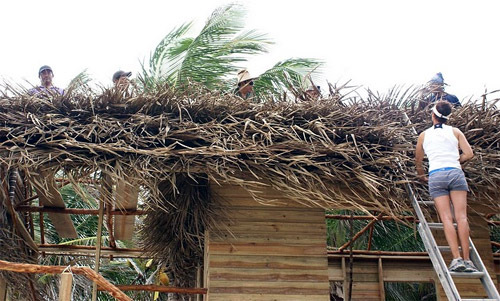 But there’s no rationale to do it during the dry season, which is BEFORE hurricane season, you might re-thatch several buildings, only to have the roofs fly off before anyone gets to stay in the cabana with the new roof! 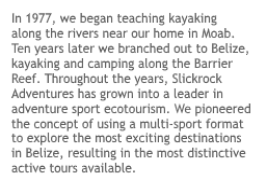 This year we built the new Vela kiteschool cabin, we completely remodeled the Iguanaville cabana, we built the new women’s urinal, and rethatched 3 cabanas! We are already discussing what we plan to do next fall. ← Will I get bored out on the island for a week?